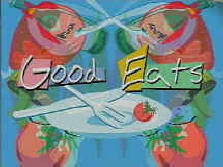 Good Eats with Alton Brown is almost over. The last one-hour episode is in the can and will air sometime in early 2012 from what I hear ... just before the world ends. I want to say how wonderful it's been being the self-proclaimed #1 aficionado. AB and his staff has been gracious enough to allow me to have a small part both in front and behind the camera. And it's given me no end of joy to know that our transcripts here at the fan page have been valuable as a resource for his research staff. So thank you, Mr. Brown, for 12 years of excellent Food Network programming. We wish you and Be Squared Production the best in all of your future endeavors. You've educated in the masses in cooking, science, history, lore and proper kitchen thinking. I'm sure Good Eats will be a valuable assistance to many generations of future cooks like it has for this one. 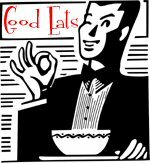 So if you're here for the food, head on over to transcripts of every episode along with reams of other Good Eats information. Oh, and don't forget to play with your food! And his coaching on subjects like blender liquefaction6. Alton Brown IS Good Eats!